The Signature Sundays came to a dramatic end, with the Round Ubin Race resulting in many thrills and spills (some literally). A total of 33 boats took part in the final race for the series, an impressive turn out which tops last week’s Round Tekong Race. There was very little room for error at the start line, as sailors faced a strong outgoing tide which eventually pushed some boats over the line before the horn went. Gary Schmidt, skipper of The Blue Bug became the first MoB for 2019, getting a lot Weta than he probably wanted to. In a show of great sportsmanship, Jong Dee and Temptress of Down from the IRC and PY classes respectively sprung into action to pick up the skipper and stray boat. Not giving up, The Blue Bug continued to circumnavigate Ubin and eventually completed the race in a respectable 2hrs 40mins! Amongst the other 3 Wetas ahead, R2D2 took first place and line honours, followed by Itchy-Go in 2nd and The Striped One in 3rd. Despite the MoB, The Blue Bug did enough to take 3rd place in the overall standings, tied on points with 2nd placed Itchy-Go bust bested by her bullet at the Round Tekong Race. R2D2 became the first Weta champion for the Signature Sunday Series, scoring 2 bullets from 3 races to finish with 7 points in total. In the Beach Catamaran Class, Madfish II return to their winning ways, scoring a bullet comfortably ahead of close rival and defending champions Stray Catz. Their time of 1hr 13min 18sec may not have broken the under 1hr record set by Martin Pickrodt’s Nacra Carbon 20 in 2017 (0hr 59min 17 sec) – but was still an hour faster than last year’s timing due to the favourable conditions. Stray Catz‘s 2nd place finish was more than enough to secure her win and defend her title in the overall series, topping the table with 4 points from 3 races. The Taipan F16 007 helmed by Louis Lim completed the Round Ubin podium in 3rd. Despite finishing outside of podium in yesterday’s race, Persian Cat did enough to secure herself a 2nd for the overall series, 5 points adrift. Madfish II’s bullet played a big part in ensuring they made up for missing Round Tekong and taking 3rd overall. A massive fleet of 9 boats for the Cruising Multihulls took part in the sprint around Ubin, making it the 2nd-largest class participating. Jaza Too continue on their red-hot form, taking victory for the Round Ubin Race in a time of 1hr 43min32sec. It was a close fight for the top 3 till the end, as 2nd placed AbraCaDeborah finished a slim 20secs after and Eeepai trailing by less than a minute behind. 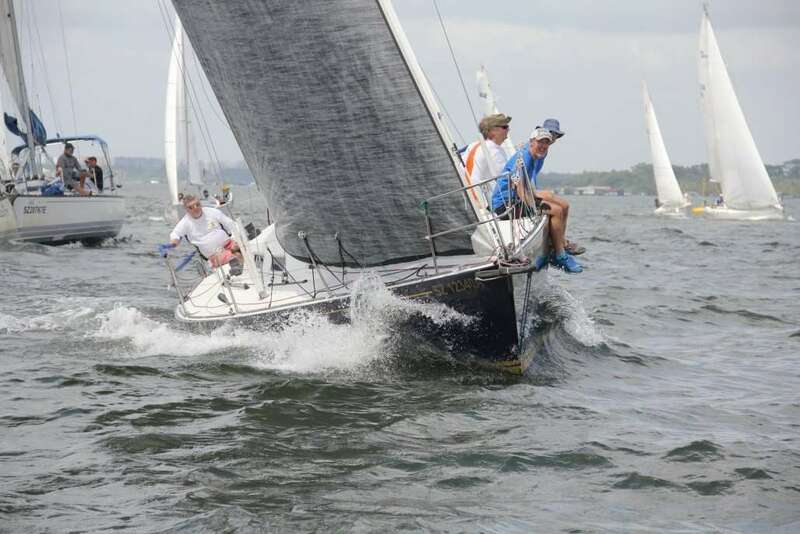 It was AbraCaDeborah’s win overall, as her consistent performance of three 2nd-place finishes from 3 races rewarded her with the 2019 Cruising Multihull Title. A bullet at the Felkin Race sealed Eeepai’s 2nd position overall, just 1 point ahead of Miss Visayan in 3rd. The PY Class was represented by 12 boats, resulting in an excitingly crowded start line. A heated encounter between Southern Light & Temptress of Down took place at the start, the only exciting exchange before the sailors settled into their journey around Ubin. Just missing out on podium at the Felkin Race and leaving out Round Tekong due to the lack of crew – made victory yesterday so much sweeter for Defiance. The grand dame took line honours and won on handicap to beat 14 (including the IRC) other boats across the finish line. Sangaree made amends for her disappointing performances over the last 2 weekends, finishing the Series with a 2nd for Round Ubin. A 3rd for defending champions Ikaroa was more than enough for her to secure the overall 2019 PY Title with a total of 5 points. Close rival Southern Light hung on to 2nd by a single point, fending off a strong performance by Arbudhen at the Round Ubin Race. Arbudhen’s 4th place finish for Round Ubin closed the gap between her and Southern Light, rewarding her with a well-deserved 3rd overall. Waka Tere made it 3 wins out of 3 races to take victory in the IRC Class for the Signature Sunday Series. Initially neck and neck with Born in Fire at the start, BiF had to drop out due to a snapped main halyard, effectively handing the lead to Waka Tere. It was exciting to watch her on the final stretch as she pressured PY Class’s Defiance in various attempts to overtake. Shardana’s 2nd place finish in the Round Ubin Race meant that the ‘Italian Stallion’ secured 3rd overall in the Series, despite not participating in the Felkin Race. Jong Dee’s heroics during the MoB incident did not affect her eventual results, as her 3rd place finish was sufficient in maintaining her 2nd overall in the Signature Sundays. Congratulations to all the winners and everyone who took part over the past 3 weekends! We now take a break for 3 weeks due to the upcoming Nongsa Regatta (25-27 Jan), Nongsa Neptune Regatta (2-9 Feb) and Chinese New Year (5-6 Feb)! Some of our sailors will be flying the CSC Flag high during the above races, we wish them all the best!